This NFL betting weekend, sports betting sites and fans alike will be treated to a thrilling NFC East matchup between a team wildly looking to keep their playoff hopes alive and a team looking to regain some respect after allowing a head coach to ruin Eli Manning’s legacy. 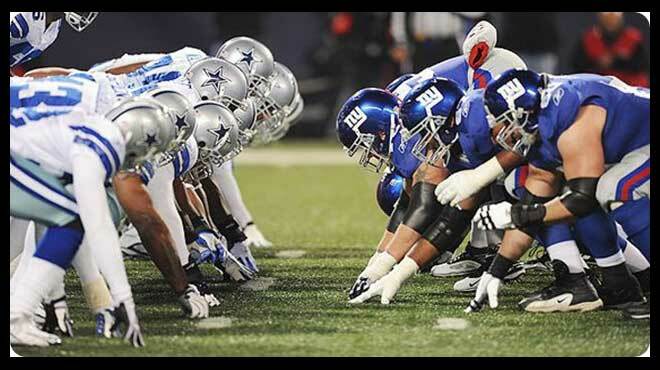 This Sunday’s NFC East pairing between the Dallas Cowboys and New York Giants may not be the most illustrious. However, it does offer some of the better action NFL gambling sites are putting together for this weekend’s action. The Cowboys ride into this weekend’s contest sporting a 6-6 record that ranks them 2nd in the NFC East behind the 10-2 Philadelphia Eagles. There’s not much hope left for the Cowboys in the division but Dallas hasn’t been eliminated from playoff contention yet. Against a team with two wins like the Giants, the top sportsbook sites from around the web will peg Dallas as the rightful favorite. However, now that McAdoo and Jerry Reese have officially been kicked out, NFL bettors might see more enthusiasm out of the Giants’ locker room. Whether or not this enthusiasm leads to an upset over the Cowboys is another thing entirely. NFL wagering fans betting on this matchup should consider backing the Cowboys either straight up or on the spread. The money line isn’t quite out yet, but early estimates have the Cowboys facing anywhere from -200 to -250 odds straight up. For comparison, the spread has a more favorable payout as its listed anywhere from -105 to -110. Dallas is 6-6 against the spread this season, but they’re having more success ATS on the road since they’re 3-2. Lastly, the Giants are 1-4 against the spread at home so there’s no question that this is one of the better betting options of the weekend’s lineup. The Giants have stumbled their way to a 2-10 record that pegs them as the worst team in the NFC East. New York came into the 2017 season with big expectations after going 11-5 in McAdoo’s first season. Nonetheless, McAdoo’s inability to bring order to the Giants’ locker room eventually led to the downfall of this team. Furthermore, McAdoo’s willingness to throw Eli Manning under the bus reflects poorly on the type of coach he is as well as the type of man that he is overall. Steve Spagnuolo, the Giants defensive coordinator, has taken over as interim head coach. A glance over both of these teams’ numbers will reveal that the Giants have quite an offensive challenge awaiting them this Sunday. New York ranks penultimate in points scored per game, and they also have the 22nd worst passing attack and 27th worst running game. And even though Dallas doesn’t have the best defensive unit in the NFL, the Cowboys still rank 21st against the pass and 12th against the run. Barring some miraculous performance from the chip on Eli Manning’s shoulder, NFL gambling sites will be expecting to see a disappointing performance from Big Blue’s offensive unit this Sunday. The Cowboys haven’t been that great offensively ever since Ezekiel Elliott’s suspension was reinstated. But the fact that Dallas beat Washington 38-14 this past weekend makes it seem like America’s Team has finally worked out the kinks.